This is a global portal for all Swimrun Women: experienced Swimrun ladies and females in all ages that are curious to try Swimrun. We want to inspire you to try Swimrun, become a better Swimrunner and to Swimrun with new people at new places. We think Swimrun is the optimal sport. You get closer than ever to nature, and you get to challenge yourself with trough training sessions or by completing long and short races across land and water at truly inspiring locations. And perhaps the most important – you get to share it all with your Swimrun partner. 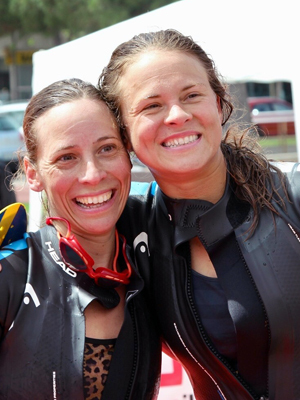 Training and living Swimrun makes you feel empowered, and we think every woman should try it. There are way too few women in the sport right now, and our mission is to change that. Are you in? Fun, friends and Swimrun. Come with and experience everything about the sport for real – with other women and organised by women. Get it all in our WILD Camps in Costa Brava. Hvar, Stockholm, Utö and France/Spain. Together we are stronger and by spending time with and talking to others you never know what opportunities or experiences might evolve from it. By creating an open forum for all Female Swimrunners in the world, we hope to help and encourage each other and to see even more women try their first Swimrun. The WILD Foundation is currently under creation. Our vision is to use a substantial amount of the revenue from each WILD Camp, and put it back in the WILD Foundation to help more women, especially those who find themselves in a difficult situation, to boost their confidence through Swimrun. The first step will be to use the resources from the WILD Foundation to organise camps for young women who for any reason might lack confidence or find themselves in a situation where they could use some help and inspiration. In the long run and on a bigger scale, we want to contribute to women’s participance in sports globally. International content marketing specialist within e-commerce and Sports & Entertainment. Former elite Swimmer in Sweden and at University of Louisville. Engaged, from Sweden, living in Barcelona. Since 2015 Fanny has mainly focused on Swimrun and Open Water swimming and her list of merits is impressive with several podiums including 2:nd at the ÖTILLÖ Swimrun World Championship two years in a row. Fanny has years of coaching experience in competetive swimming and swimrun. It is incredible to watch her move in the water and hang on if you get a chance to be attached to a tow-rope to this woman. International business, sales and marketing manager with event and project management experience. Educated ski-instructor, running coach and did competitive showjumping and eventing as a teen. Mother of two, from Sweden living in Stockholm, Sweden. Maria became a runner for more than 10 years ago and since early 2017 Swimrun has been a huge passion. Maria did seven Swimrun competitions during her first year as a Swimrunner with podiums and wins in the majority of them including ÖTILLÖ races. Holds an extra passion for introducing the sport to complete beginners and make sure to watch her feet if you see her running downhill, it goes fast.